What happens when an architectural designer likes to bake? Dinara Kasko is what happens. 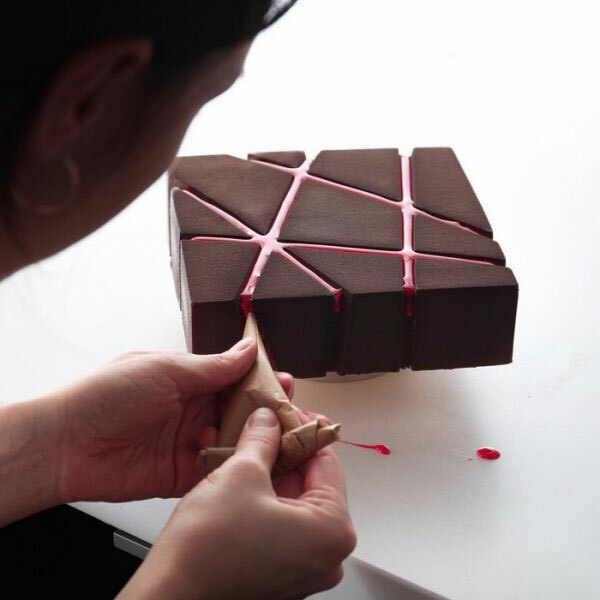 The Ukranian pastry chef is the master of combining baking with geometric figures and architectural designs. 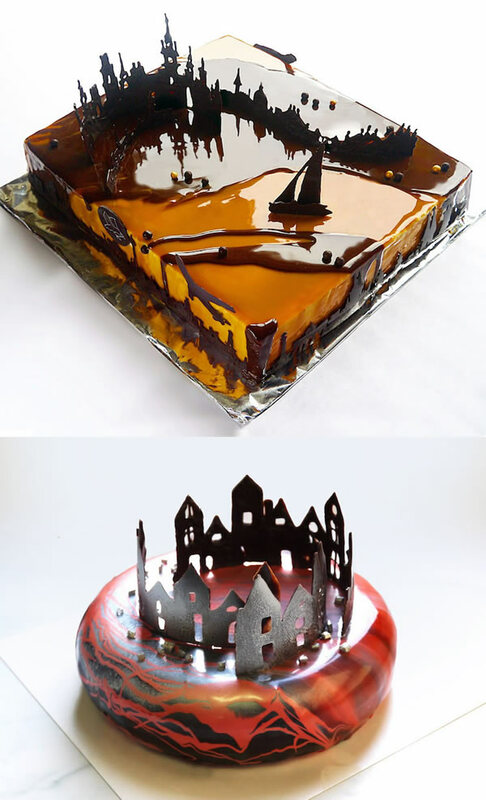 She approaches her desserts as if they were buildings, and creates the most unique edible structures ever. “I have many unrealized ideas and a great desire to experiment. I don’t want to imitate others; I want to create something new,” Kasko told So Good Magazine. And she sure does! The only question now is, how do you eat something so beautiful?! When First Canadian Place called us to make a cake replica of their Toronto tower, we jumped on the opportunity to take our cake building to new heights (har har)! By the time we were through, we all felt as though we’d earned an honorary architecture degree. For now we’re going to stick with flour, butter and sugar (instead of steel and brick) but here’s how we made it happen. 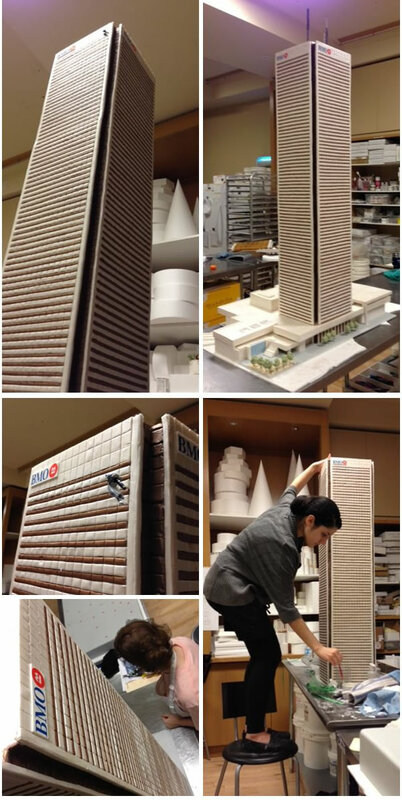 The building is Canada’s tallest office complex which means that the tower cake was definitely the tallest cake we’ve ever made, standing almost five feet tall! Just to compare, that’s the size of your average ten year old boy. The height required a LOT of forward thinking to allow for the weight of the tower without a toppling over situation (which would’ve definitely been a party foul). At it’s location in Toronto’s Financial District, the building has 72 stories. That’s a lot of sugar! We received the architectural drawings in order to make a perfect scale version. If you’ve ever seen blueprints, you’ll know how complex they are. Luckily Daniella, a member of the B&B team, has an advanced degree in math and she helped us decipher the complex codes and drawings, perfectly scaling the huge tower into a smaller version. 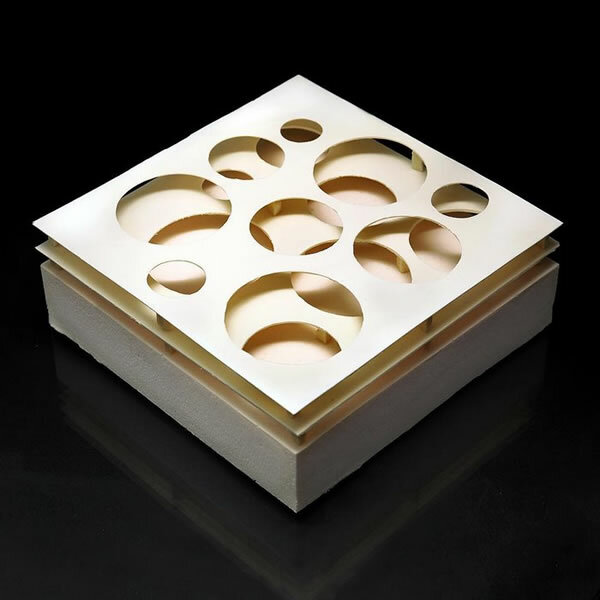 We also received samples of the exact marble of the floor and glass of the windows so we could replicate them perfectly in cake and sugar pastillage. It was a bit of a challenge to achieve a marble effect in sugar but we love trying new techniques and were really pleased with the result! If you’re one of the many who just got engaged over Valentine’s weekend, it’s time to get into planning mode, and what better way to start than with a spectacular wedding cake. A New York wedding calls for a cake that tastes great, makes a statement about the newlyweds, but can also stand on its own amidst the glamour of the Plaza, the Art-Deco glitz of the Rainbow Room, and the skyline that twinkles all around at the Mandarin Oriental. For this, brides and grooms turn to cakemaker extraordinaire Ron Ben-Israel. With the season for “I do” quickly approaching, 6sqft spoke with Ron to discuss his love for the baking process, the thinking and work behind every cake, and the joy he experiences each time one is completed. Do you have early memories from the kitchen? I was always fascinated by the magic in the kitchen. I’m still fascinated by how things come together. You put together flour, eggs, some liquid and leavening and the cake rises. For me, it’s still a miracle. Of course, I had a sweet tooth and I loved the flavors, but it’s also the chemistry of it; the mechanism of mixing things together and how heat or cold affects them. I love things like Jello mold or how you can fold the egg whites into melted chocolate and make it airy. Still when I talk about it I get excited. Was there a particular moment when you realized baking was going to be your career? No, I never made the decision. It made a decision for me. I was working as a designer for showrooms, tabletops, and store windows, and some clients asked me to do cakes for windows to show off china. I always baked and cooked, and people started asking me to do it. They offered to pay me, at which point I said I better take some courses. I didn’t have enough money for the classes, so I started assisting and teaching and it just started rolling, and before I knew it I was in business. When you set out to make a wedding cake, where do you begin? It always starts with the people getting married or celebrating. When we meet the clients, we of course show them a lot of things we’ve done in the past, but I try to coax out of them who they are to get to know them, a little bit about their personal history, what will please them, and what their styles are – anything from their favorite color to favorite flavors. Every couple that gets married likes to talk about themselves and how they met. I find out a lot about who they are by them telling me the story. I like to see the ring. And then I also have a checklist of specific things. So for instance, I like to know what they’re wearing. If they have bridesmaids, I find out the color and style the bridesmaids are wearing. What flowers are in the room. Even what menu they are using, what time of the year. And of course the environment — is it a ballroom, a modern space that was just built, a loft. 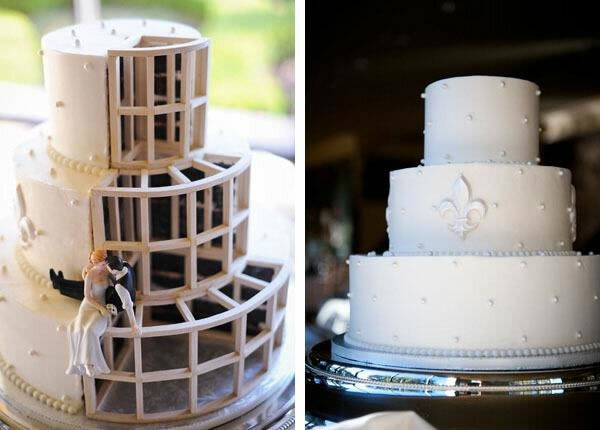 The architecture that surrounds the reception will have to somehow be acknowledged in the cake’s design. 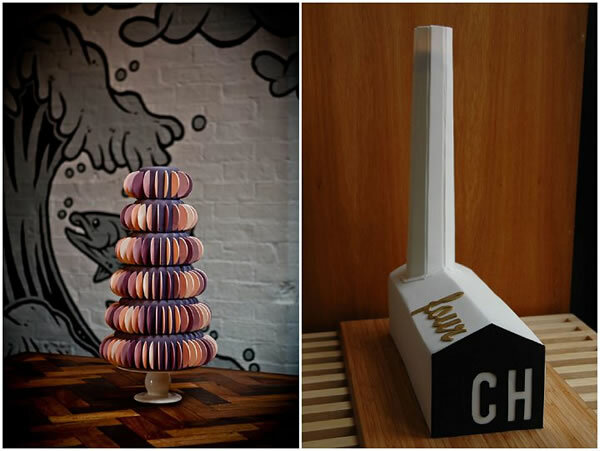 You mention the spaces’ architecture, but can you talk about the architecture of each cake? It’s interesting because when I moved to New York I was doing a lot of tabletop store windows, and I saw wedding cakes that I totally did not identify with. I didn’t get why people were making very short, stocky cakes. What was very popular was the three-tier wedding cake. I really didn’t understand it because I like four, five, six tiers. I felt that in Manhattan the cakes should be tall and narrow to reflect that environment. We don’t have so many huge ballrooms, but we have ballrooms that are fantastic from the 19th century. A lot of banks have turned into party spaces, and there’s grand hotels that used to be mansions like the New York Palace. I started making cakes that would speak to the architecture. I figured out that tall, uneven numbers were attractive, so we became known for five-tier cakes. Around Rockefeller Center we have a lot of Art Deco, which is always very stylish. So we’re bringing cakes to the Rainbow Room and to the other spaces at Rockefeller Center. If you look at properties such as the JW Marriott Essex House, the elevators are all decorated in Art Deco. So that’s always a source of inspiration. If I bring a cake to to the Plaza Hotel or the New York Palace, where they have a lot of gold architectural motifs, I get inspired by that. With your interest in design, do you spend a lot of time looking at buildings? I love New York, and I always look up. That’s why I bang into people. We actually enjoy very much doing cakes that are inspired by buildings. You really have to understand the architecture of the buildings, so if possible we go to the site to analyze it. In 2007, we did the 100th birthday of the Plaza Hotel, which is the biggest cake we’ve ever done. It was 12 feet tall and was displayed at the Grand Army Plaza in front of the hotel. We worked with the restorers of the building and got the blueprints and learned all about the history. We had to be very meticulous because you can’t cheat when you do a building. Do you think couples today are more open to use of color on their cake? Most of our clients who come to us are from New York, or if they come from out of town, their eye is to the New York style. They’re very sophisticated; they come with clippings. They really do their research, and they don’t come to us because they want a regular cake, but because they want something stylistically unusual. With weddings we do push the envelope, but it has to be within very elegant and stylistic surrounding. We have done a lot of cakes in the past year that are actually navy blue; they work really well. And of course a few years ago we started doing grey and black iced cakes, which is such a great statement, especially in Manhattan in locations such as the Rainbow Room and the Four Season’s Restaurant. I’m surrounded by people who used to be my students. We are a little bit formal and rigid, but in a good way, in the sense that we have a formal internship program that you have to go through if you want to be employed here. That’s how we develop people who themselves have discipline and talent so they can execute this kind of work. Because we have a team of eight here, when one person bakes the cake, another person will make the buttercream, which makes it much better because we don’t depend only on one person. It’s a little bit like a fashion house in the sense that you have the seamstress, the draper, the people who cut the cloth, and everybody cooperates on the same project. It’s clear that you’re deeply committed to teaching others the craft. What is one thing you always tell your students? They have to put their heart in it, but also their mind because it’s really like structuring a building. There’s a whole inner structure. Students come to me and they’re very passionate and artistic, which is great. But the other 50% they need is to be clever because you can’t just make a cake rise with passion. You need to be scientific about it. You need to be a builder, be thorough. Let’s talk about delivery. What does it take to move one of these cakes to the venue? We used to be in Soho for many years on the top floor of a commercial building. As charming as Soho was, the cobblestone streets are torture on the cake. We actually had to install special shock absorbers in the van to allow us to go through those streets. Luckily, we moved last year to the Garment District to a building that is 80 years old. The Garment District is great because all the floors here are cement and our particular floor used to be a shoe factory and showroom. Really, the delivery starts when you are coming out [of the building] We have two great elevators now, and the streets are very wide so the van or truck can pull in really easily. Then we get to the location, which is always a story in New York City. First of all, the cakes require two people to lift it. A lot of the locations don’t have loading docks. Often, you don’t have parking so we have to plead with the doorman to watch the van while we run upstairs. 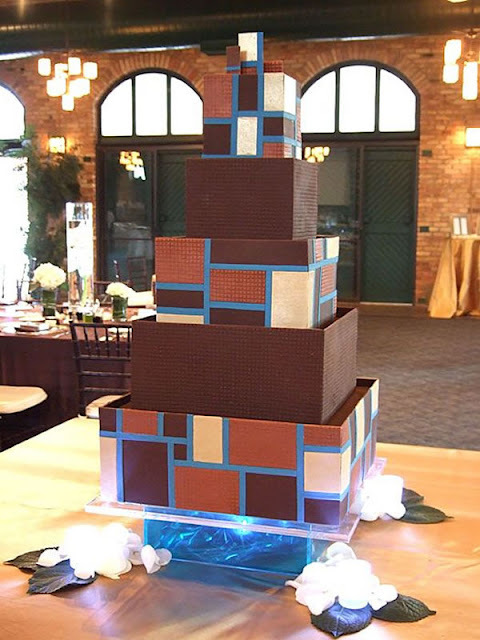 We are also the exclusive provider of celebration cakes for One World Observatory so you can imagine the security. It’s always like a military operation. Of course, the cakes get refrigerated and crated so they are protected in boxes and very well labeled. And we never send a cake by itself. We always have to set it up and make sure that everything is perfect before we go away and let the celebrants see the cake. What does it feel like when you see a completed wedding cake? That’s very, very satisfying, and my favorite part is when the couple cuts the cake and feeds each other. That’s a great, great moment. The whole process after meeting the clients, I’m separated from them. The work is done in-house, nobody gets to see it. We keep it highly confidential. Even if they’re not celebrities, we don’t tell anybody what we’re doing. It’s a big surprise. Just like the bride with the dress, the groom is not going to see it until the wedding. For me, delivering the cake is the big reveal, it’s like the opening night on Broadway. When the couple sees the cake for the first time, it’s a source of enjoyment, and then they cut the piece together, that’s the first job they’re going to do together. The symbolic meaning is that they are sharing the sweetness and the joy with everyone during the reception. For engaged couples who are starting to think about their wedding cakes, what advice would you give to them? I think it’s imperative that they research and find out who they want to work with, and this is for all the vendors. Get recommendations and narrow down the list. There is no substitute for visiting the bakery. They should see who is actually baking the cake, see the environment. I always think it’s best to order the cake from a licensed location that has all the health certificates and insurance of course. If you could select a cake flavor or icing that you feel epitomizes New York, what would it be? We have a cake that we do that has alternating layers of vanilla and chocolate, so it’s very much a combination of black and white, and I think that’s very New York City. London-based Danish designer Kia Utzon-Frank originally trained in goldsmithing, but designs everything from jewellery to window blinds. Now, she's added cake-making to the mix. At just 21 years old, architect and dessert enthusiast Marie Troïtskaia (aka Marie Oiseau) has baked up an impressive portfolio of tasty treats. 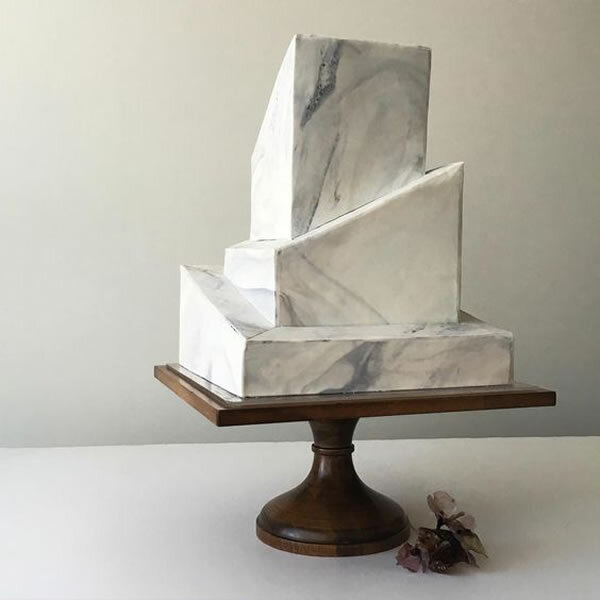 Combining her academic architectural background with her passion for sweets, Oiseau creates one-of-a-kind artistic cakes inspired by buildings, shapes, and sculptures. Like most creators, Oiseau cites numerous influences in her work, which she views through an artistic lens. 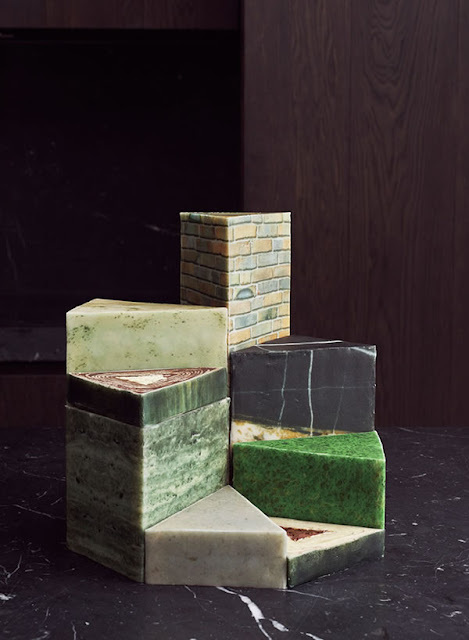 “For me, cakes – they're art objects,” she shared with us in an email. “I'm inspired by architecture, architects (Gehry, Le Corbusier, Gaudi, Utzon), architectural objects, artists, cities, materials, textures. I especially love to draw chocolate panoramas and create my own chocolate cities!” Her finished products represent this eclectic range of artistic interests, spanning abstract shapes and sculptural works to figurative forms and skyline-inspired, three-dimensional surfaces. Originally from Moscow, Oiseau now studies architecture in France, where she also is pursuing her creative career as a pastry chef. Recently, she has worked as a chef at the Moscow bakery Californecaketion, but she hopes to open her own pastry shop in Paris, where she aims to cater to architects, architectural students, and artists. 0 Response to "10 Awesome Cakes"